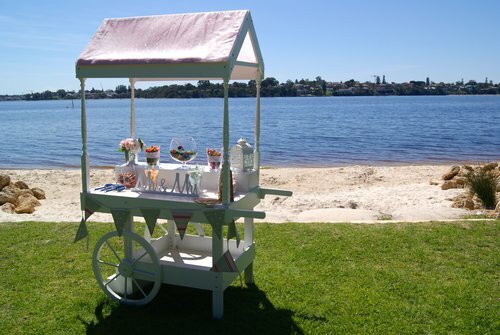 We're delighted that once again we'll get to showcase a Little Lolly Cart to brides and grooms from all over Perth and show them another brilliant twist on the traditional lolly buffet (or candy buffet if you prefer the American terminology!). Being alongside other creative and trusted wedding event suppliers really makes us feel at home! We're already beginning to plan the types of lollies we're going to put on the cart and also thinking about putting into action some of the things we learned from our first wedding expo. Also, be sure to come along and see us as there will be a door prize - and we're contributing towards a part of it, so it's sure to be pretty sweet...! Take a look at some of our wedding setups from venues like Bathers Beach House in Fremantle, Point Walter in Bicton and Joondalup Resort and Country Club. And don't forget that in addition to our elegant wedding lolly carts, we also do setups for birthdays, corporate functions and other events! Newer PostCart Only Options Added!